The Department of Politics reflects an appreciation of the cultural, historical, ethical, and theoretical foundations of political order. While actively engaging the methods and issues of social science, our courses also address the dignity of the person and the rich web of social life, consistent with the Catholic tradition that gave birth to the University. Students in the major can choose to focus on one of three sub-concentration fields: American government, political theory, and world politics (which includes comparative politics and international relations). We offer a diversity of courses for majors and minors, as well as a pre-law track, and many of our majors pursue internships or study-abroad opportunities, including parliamentary internships in London, Dublin, and at the European Union. The Catholic tradition recognizes each person as a distinct creation of God deserving of dignity and the opportunity to flourish. As a student of politics, you will learn how politics and government can help achieve these goals through the protection of basic rights, the expression of public will and the promotion of policies serving the common good. The path begins in your first year when you take foundational courses in politics and participate as a member of a learning community of about 18 students taking core classes in philosophy, theology, and English. In these classes, you will begin to grapple with questions about justice, happiness, virtue, and freedom that will help you appreciate the crucial role of politics in realizing those goods. What better place to study politics than the nation’s capital? 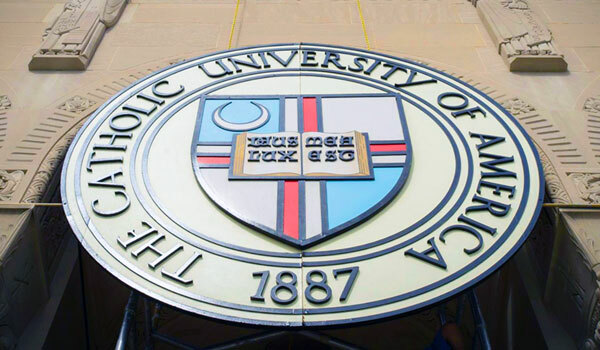 As a politics major at The Catholic University of America, you have the opportunity to see how government works firsthand and are encouraged to get in on the action. In the past our politics majors have acquired internships in the White House, Congress, on Capitol Hill, and in various other government and non-governmental organizations. You too will have the opportunity to apply what you learn in the classroom and to gain the experience you need to take a leading role after graduation. Study one of the most popular majors at The Catholic University of America, alongside some of the most engaged students on campus. You will be joining a diverse and extremely active community — with students often heavily involved in student government, on-campus clubs and organizations, and political activities and events on campus and in D.C. You will be part of a peer group full of passion, for politics, and, as you’ll find out, just about everything else they do — learning from each other’s experience and expertly guided by smart and engaged professors. Graduating from The Catholic University of America with a bachelor’s degree in politics, you will be prepared to take advantage of a diverse range of job prospects and postgraduate study opportunities. Many of our graduates have gone on to work as legislative aides, lobbyists, foreign service officers, campaign managers, journalists, political consultants, lawyers, or college professors, as well as pursued advanced degrees in politics, law, business, communications, or other related fields. For more information, please contact Matthew Green, Undergraduate Coordinator.